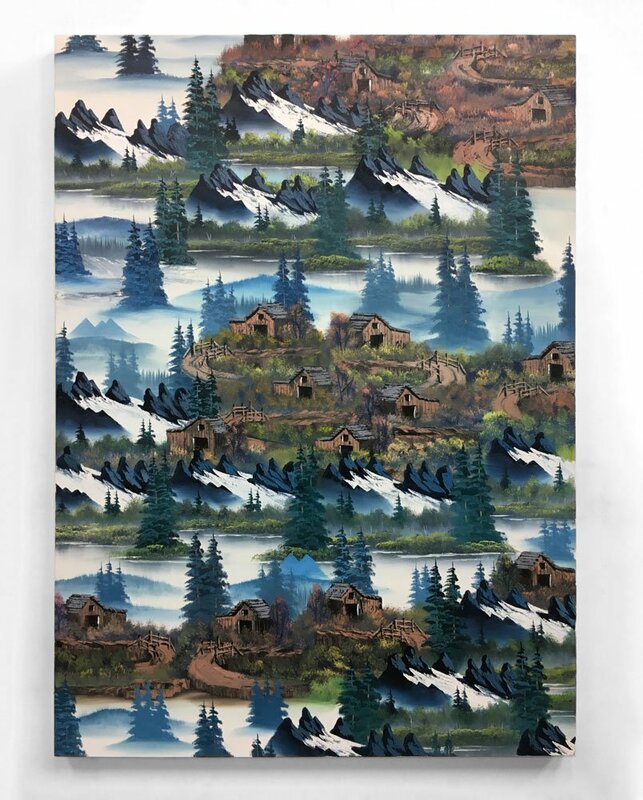 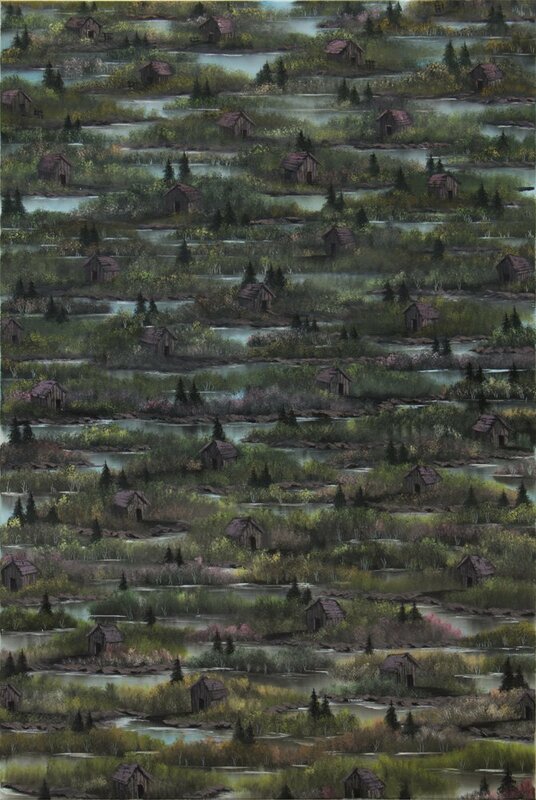 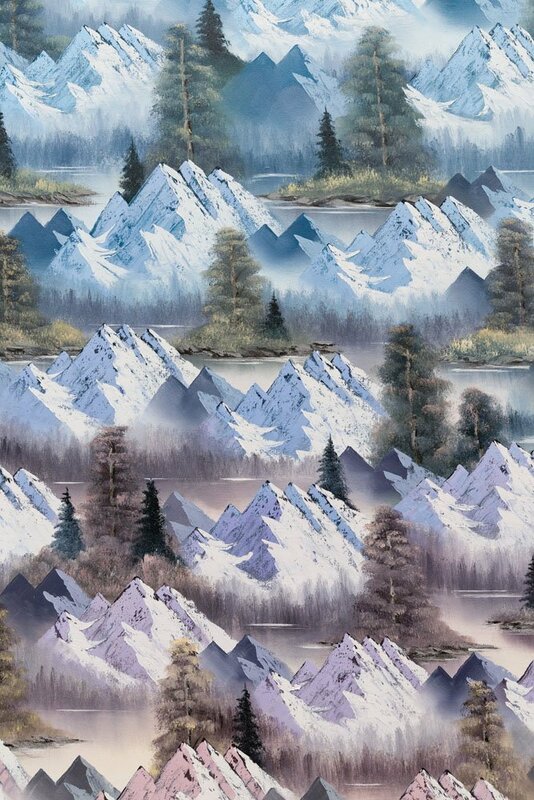 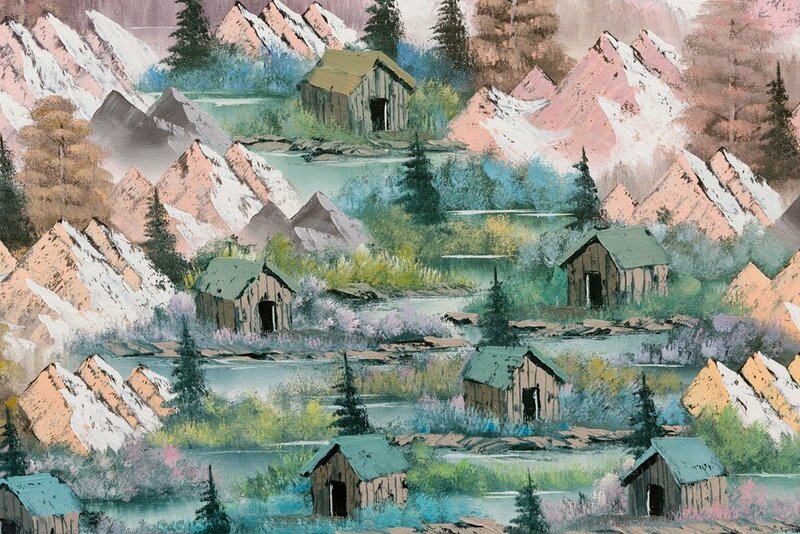 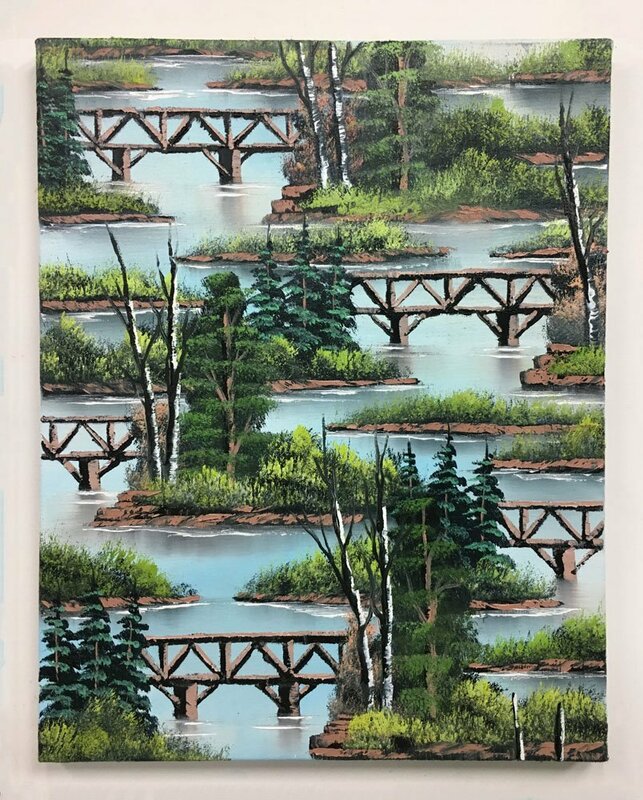 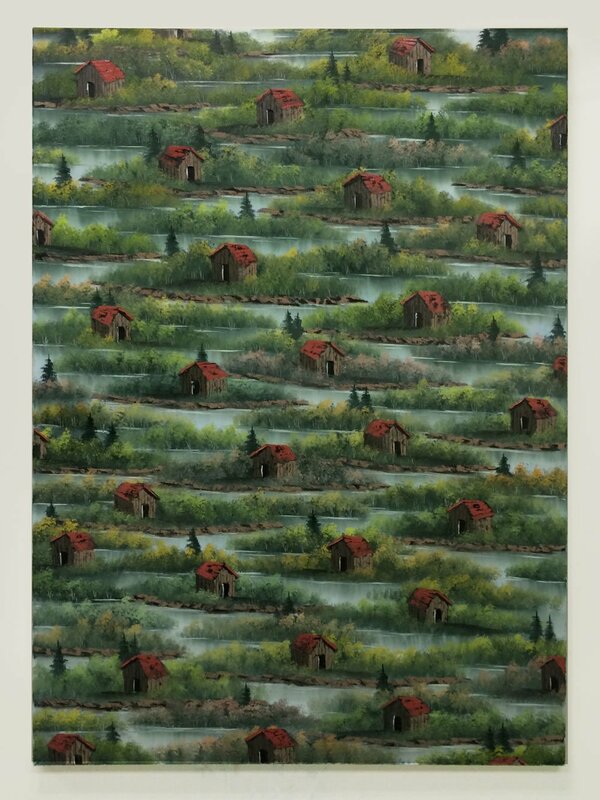 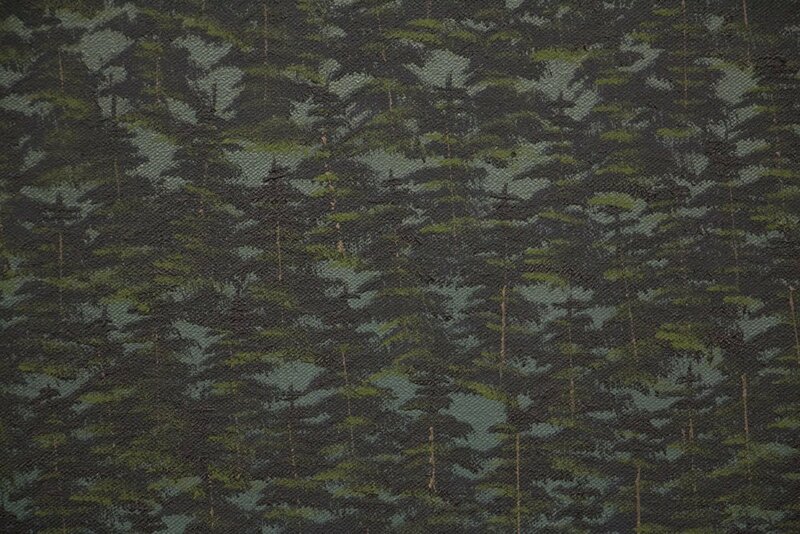 Neil Raitt’s paintings are compositions of endlessly repeated cabins, mountains, ponds, trees and other natural motifs. 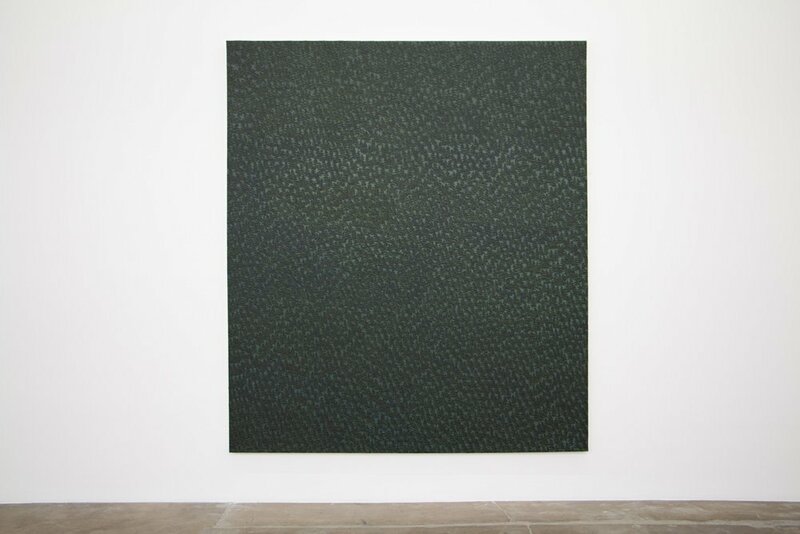 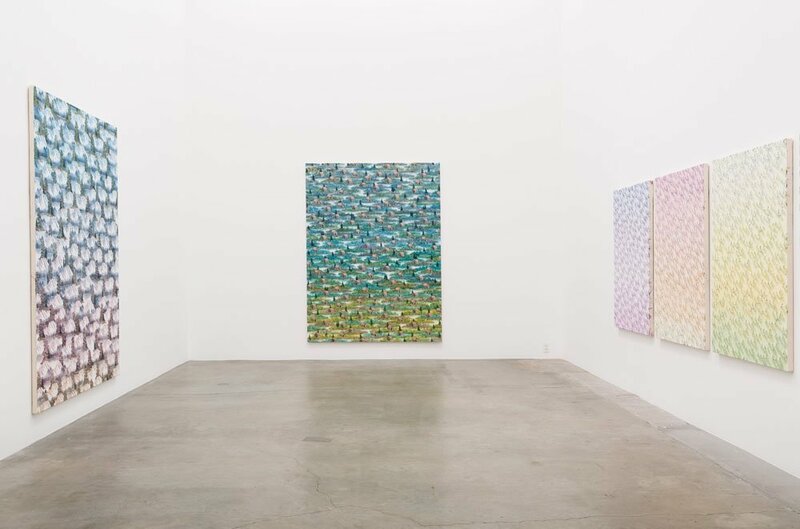 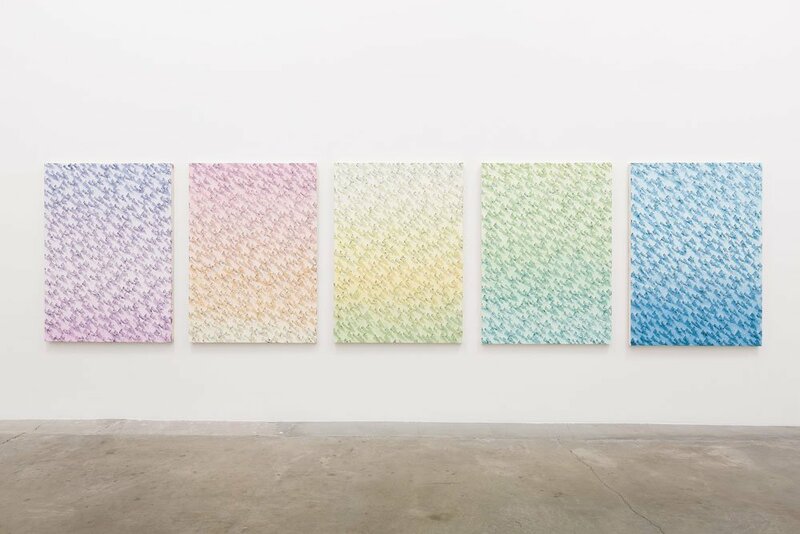 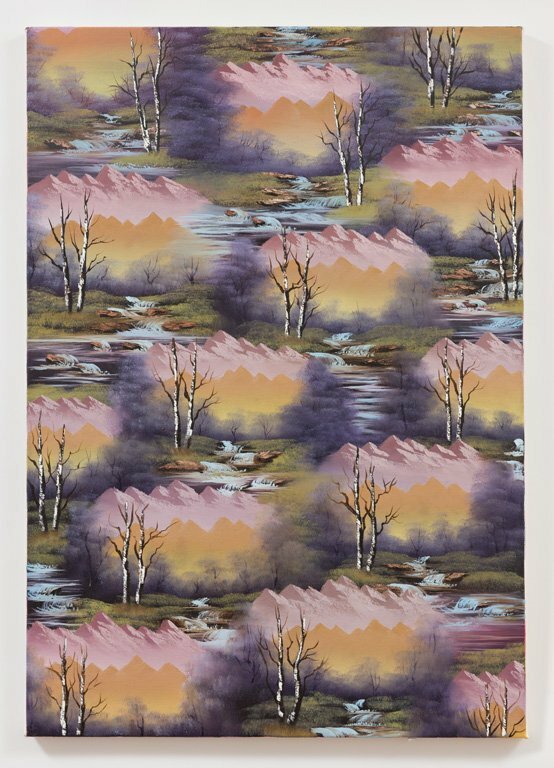 Exploring the idea of repetition itself as a form of abstraction, Raitt’s work addresses landscape painting and the accessibility of its figurative form. 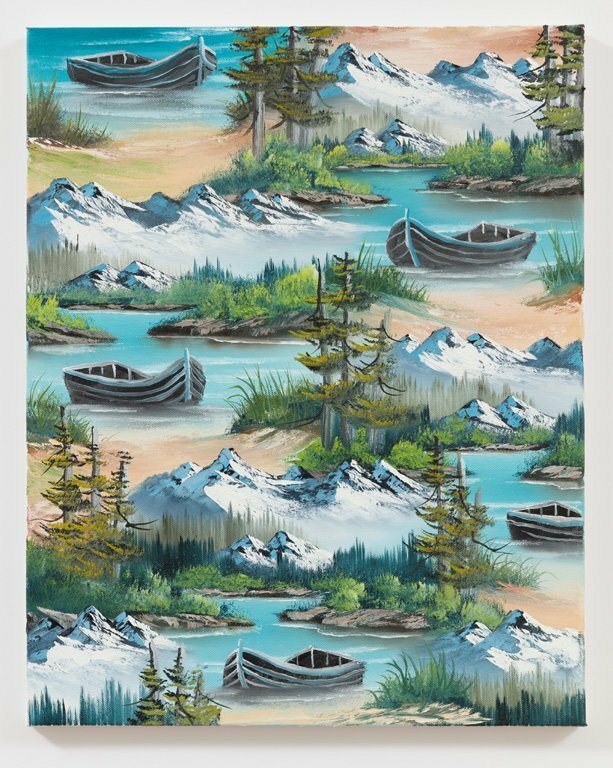 With gestures adopted from Bob Ross’ television program The Joy of Painting, Raitt utilizes identifiable imagery in his intricate patterns that suspend the atmospheric effect of landscape and its illusion of space, dispersing any sense of perspective. 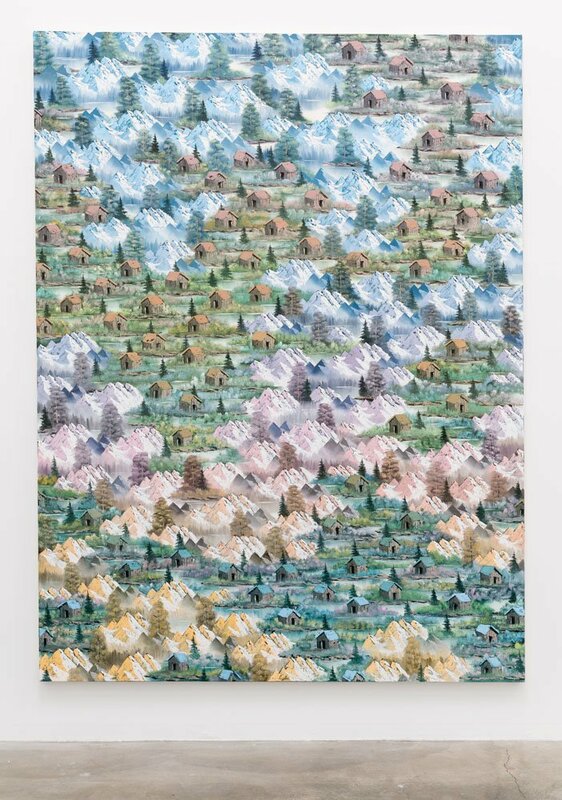 His labyrinthine patterning and ceaseless repetition suggest the imagery upon the canvas as a limitless flat patchwork that stretches into infinity. 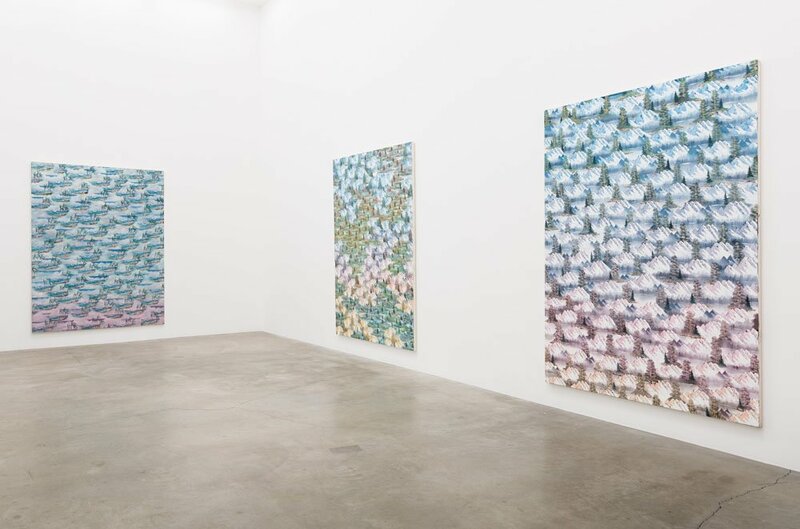 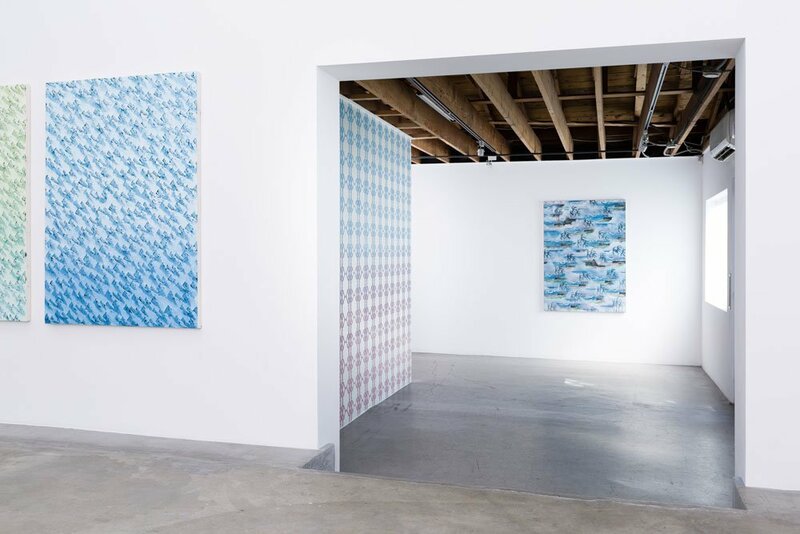 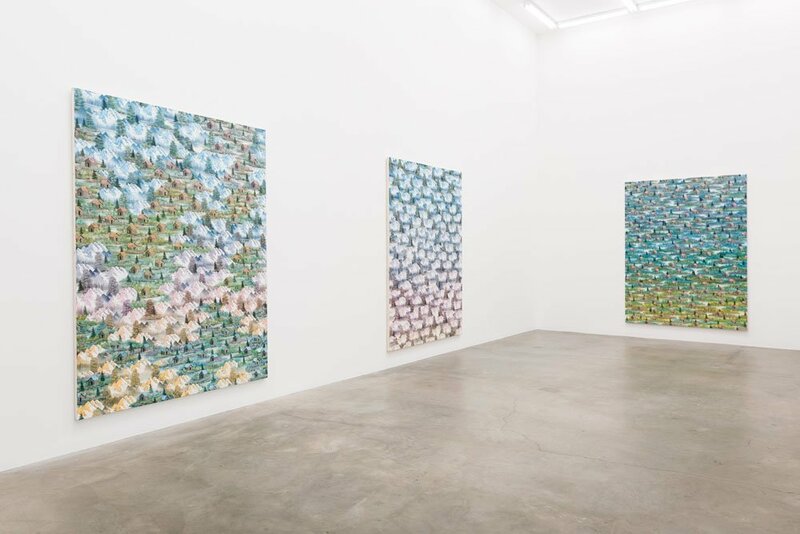 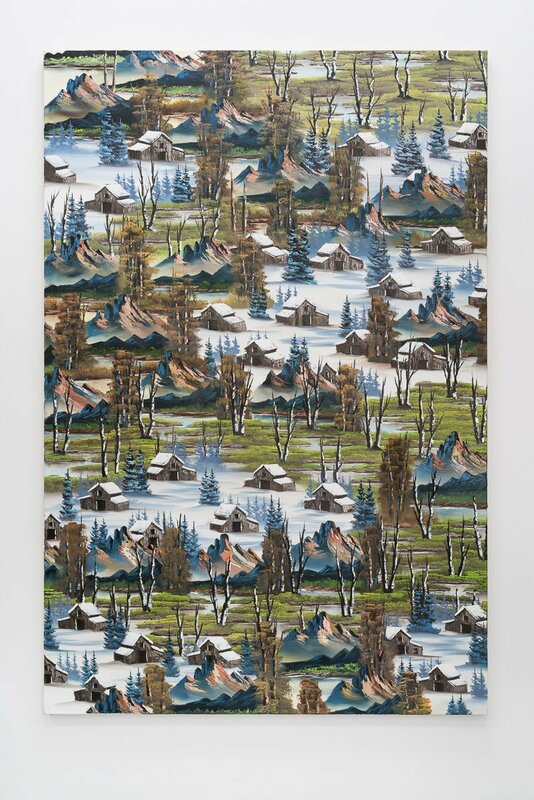 While Raitt’s work implies an accelerated machine-like production process, his work is borne of time-consuming and heavily labored oil painting. 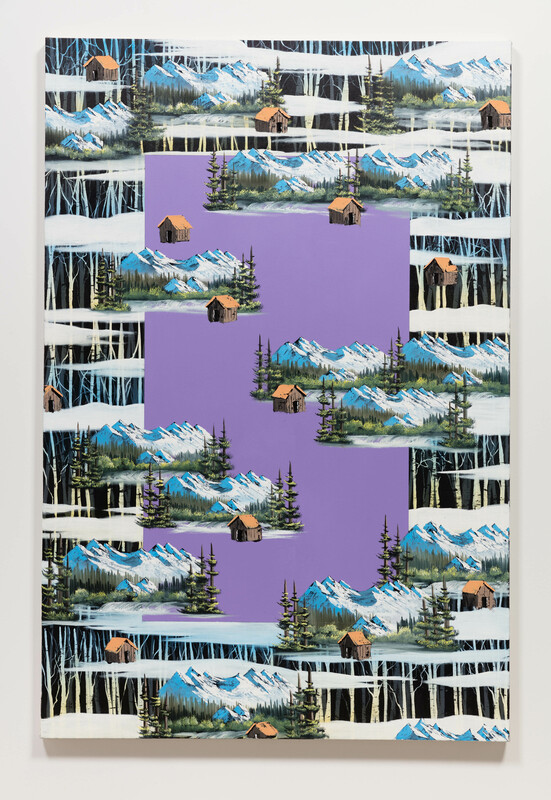 Raitt’s technical skill in painting modernizes the traditional landscape, deconstructing its figurative language with an approach that is neither wholly kitsch nor fully abstracted. 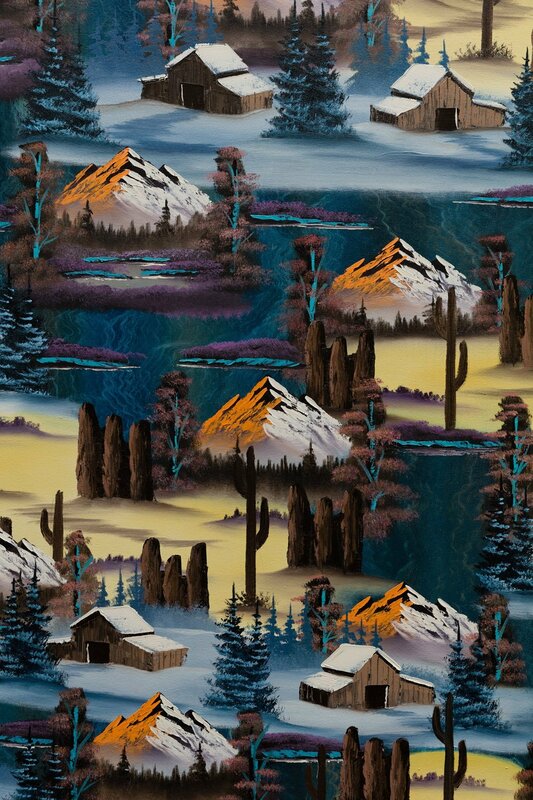 Neil Raitt. 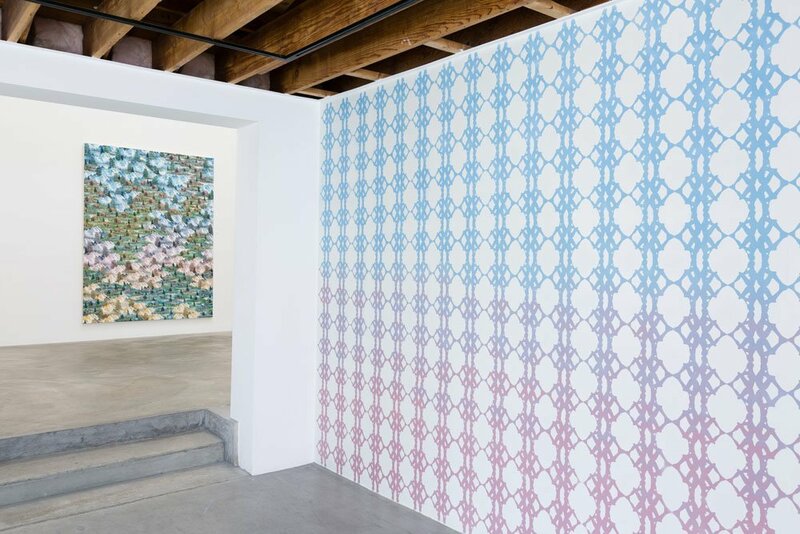 Los Angeles: Anat Ebgi Gallery, 2017. 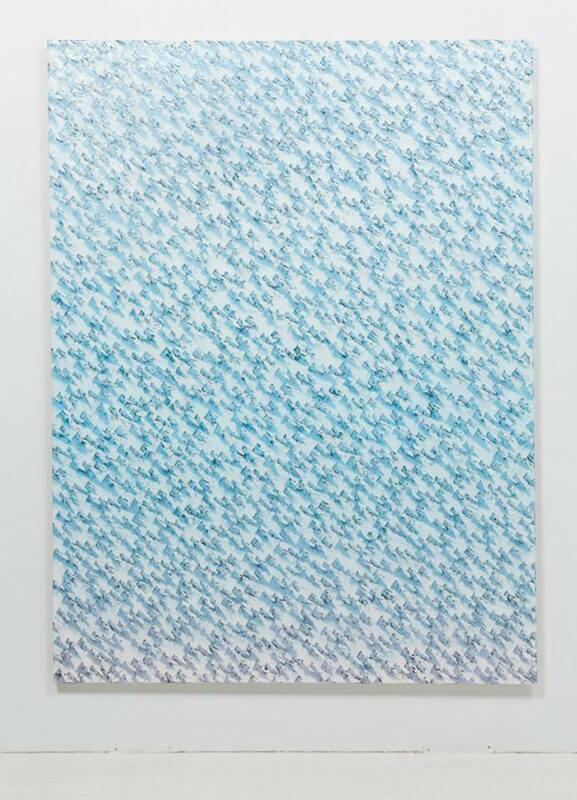 With texts by Ansel Krut, Lxo Cohen, and an interview with Lauren Bergman. 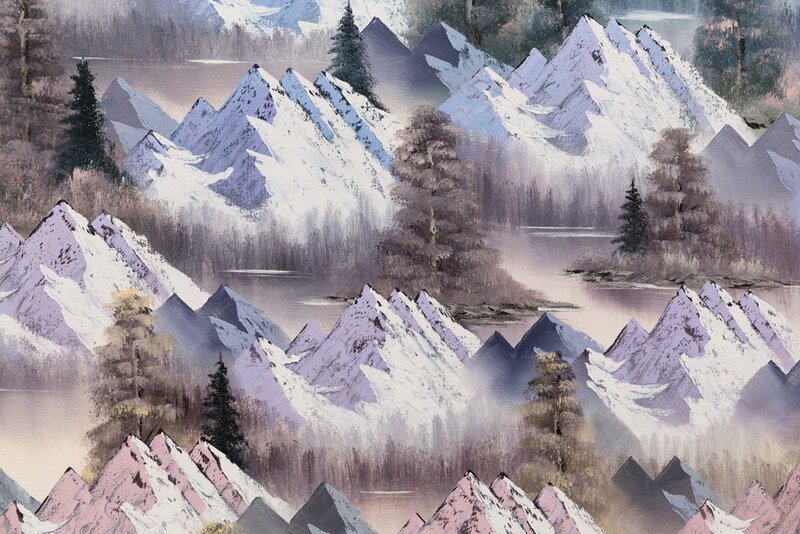 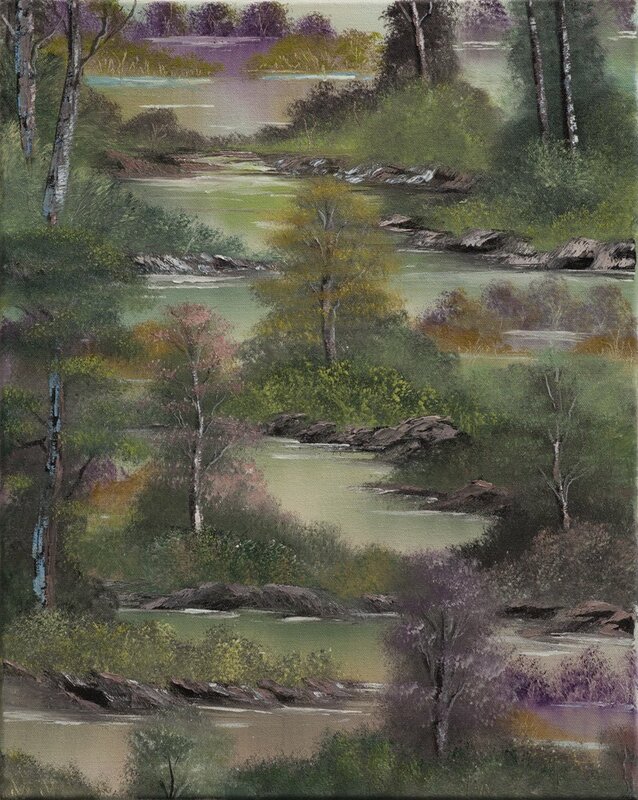 Kelly Crow, "A Renaissance for Bob Ross: Fans Want the ‘Joy of Painting’ Host to Have a Spot in Art History," Wall Street Journal, August 21, 2018. 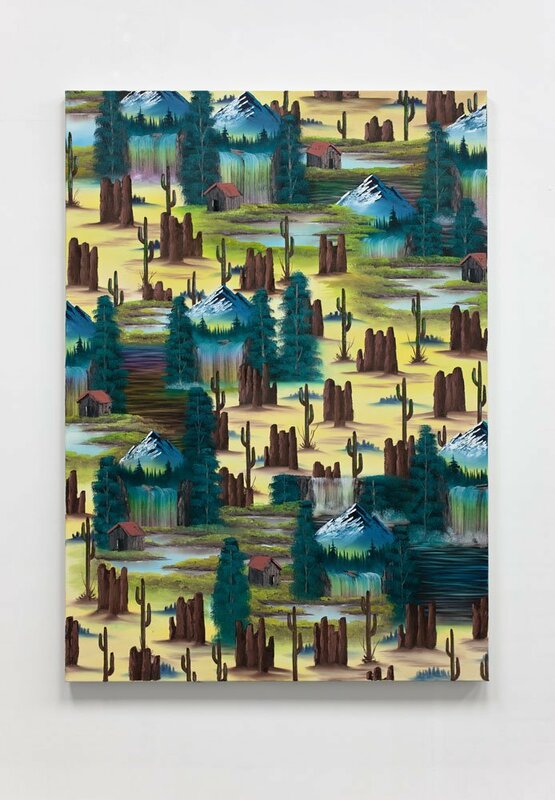 "Neil Raitt at Valentin, Paris," Cura Magazine, February 10, 2018. 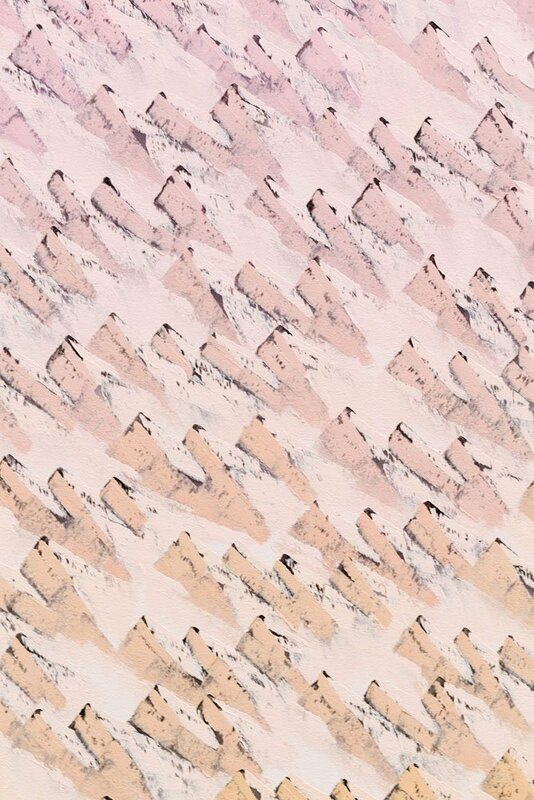 "Imitation Sand," Paris Art, February 8, 2018. 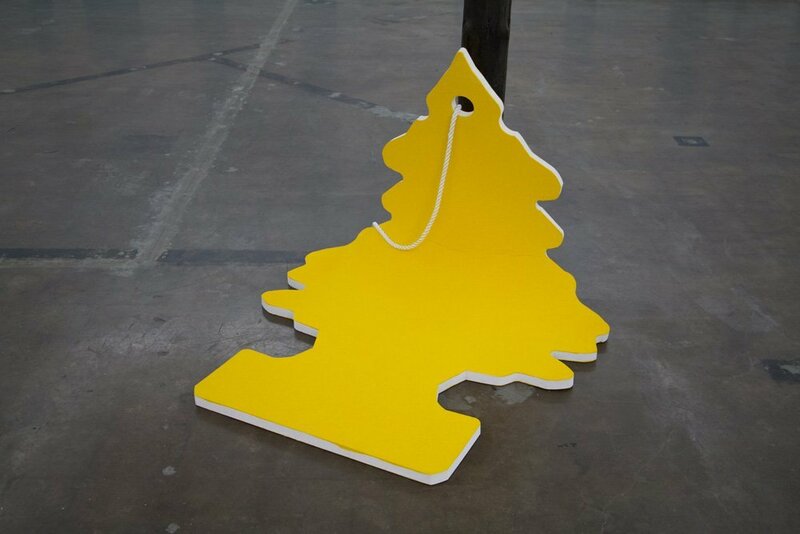 Edward Goldman, “Neil Raitt,” Art Talk, KCRW, 89.9, Los Angeles, CA, October 24, 2017. 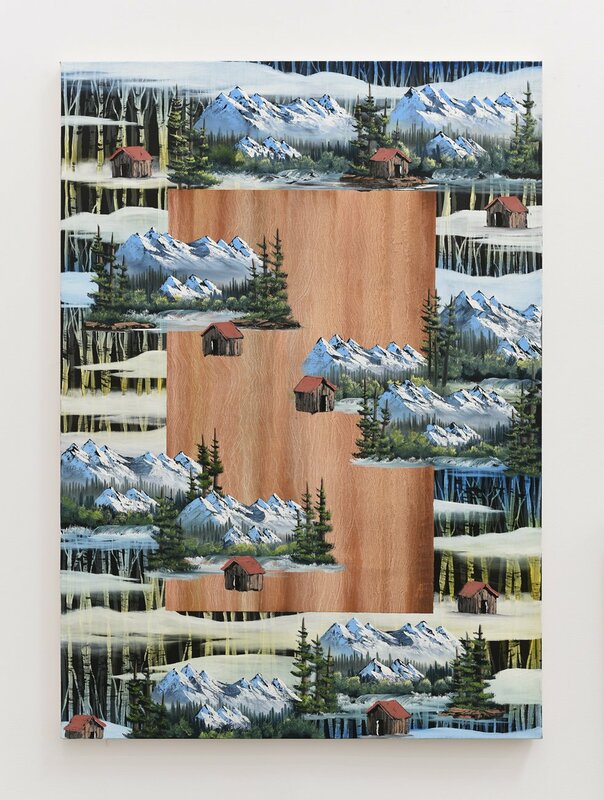 Jennifer S. Li, “Neil Raitt at The Cabin,” Art in America, November 2016. 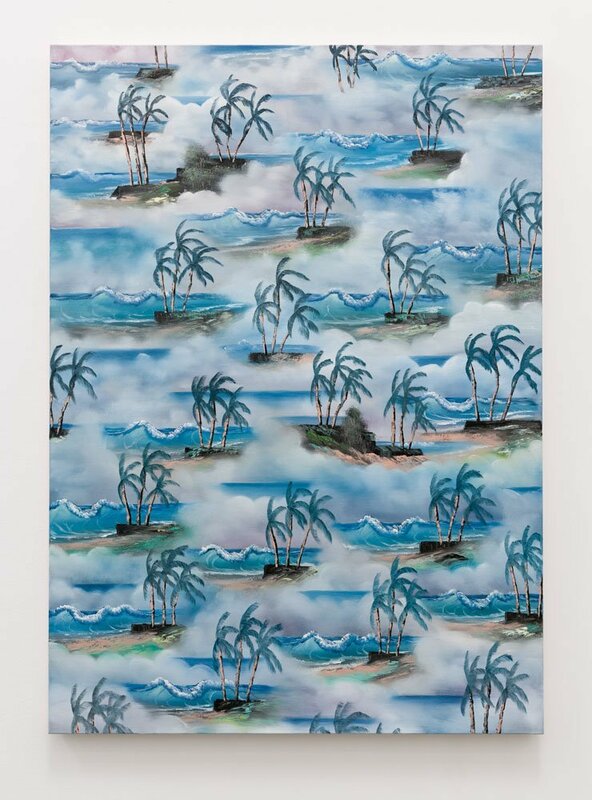 Kenny Schachter, “Kenny Schachter Comes Out to Play at Frieze London,” artnet, October 11, 2016. 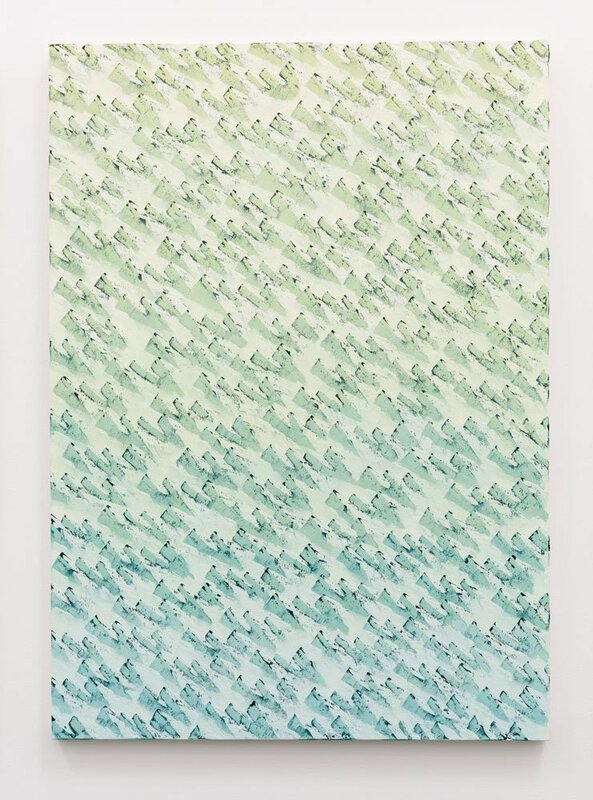 Andrew M. Goldstein, “5 Artists to Watch at the Sunday Art Fair 2016,” Artspace, October 7, 2016. 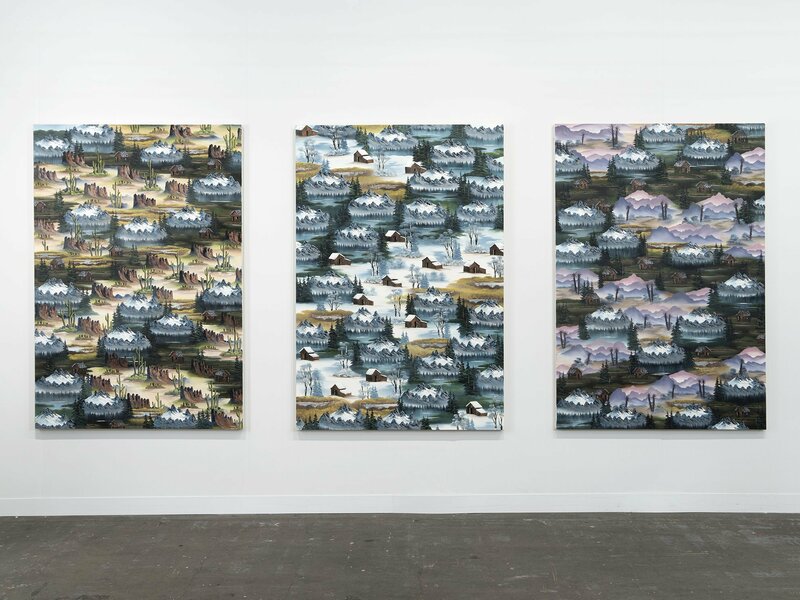 Rachel Spence, “Frieze satellite fairs: Sunday, Moniker, The Other Art Fair – review,” The Financial Times, October 8, 2016. 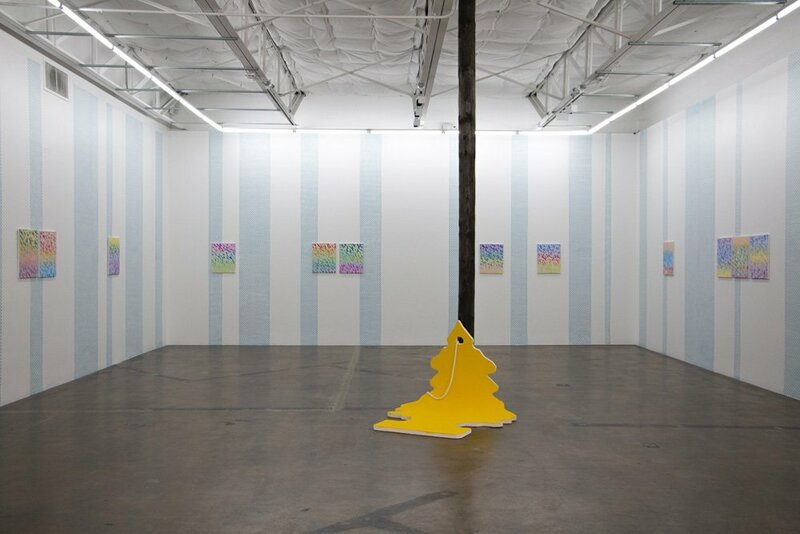 Emily Steer, “Sunday Art Fair: Gallery Picks,” Elephant Magazine, October 6, 2016. 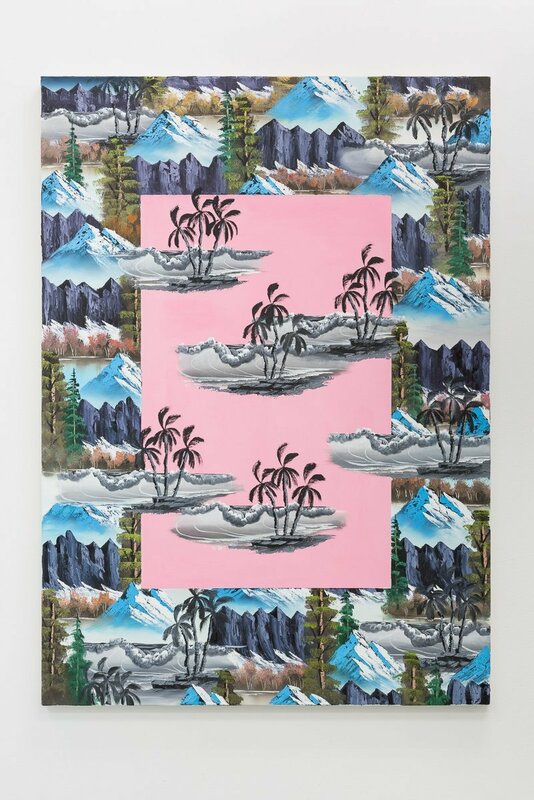 Hannah Hayes-Westall, “Top 6 artists at Sunday art fair,” FAD Magazine, October 6, 2016. 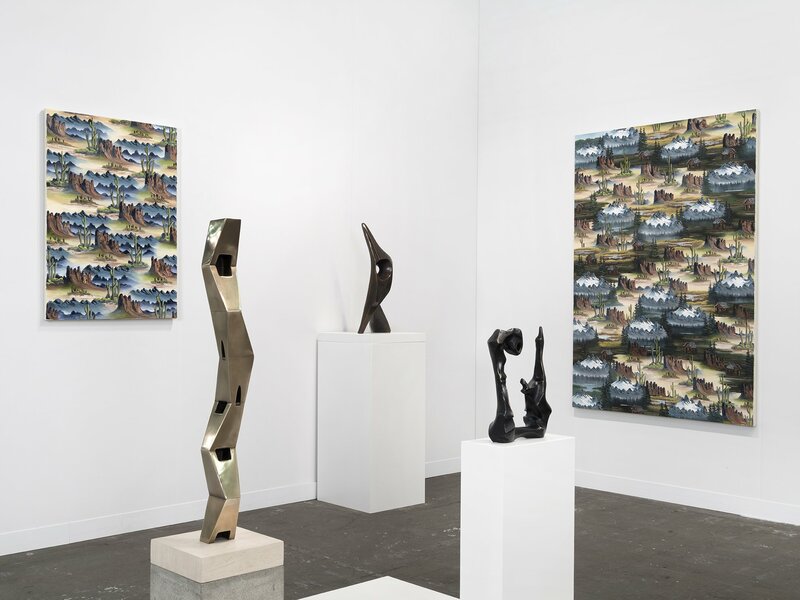 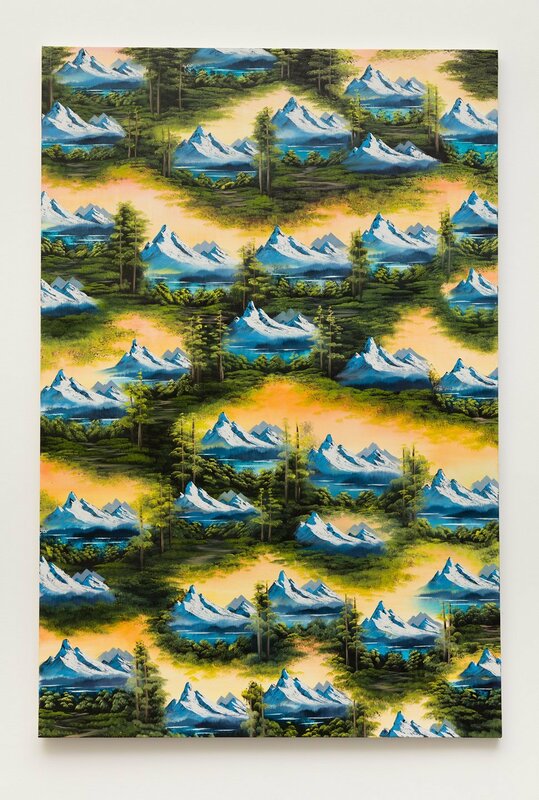 Nate Freeman, “Sunday, the Young Fair in London During Frieze, Opens with Solid Sales, Chill Vibes,” Artnews, October 6, 2016. 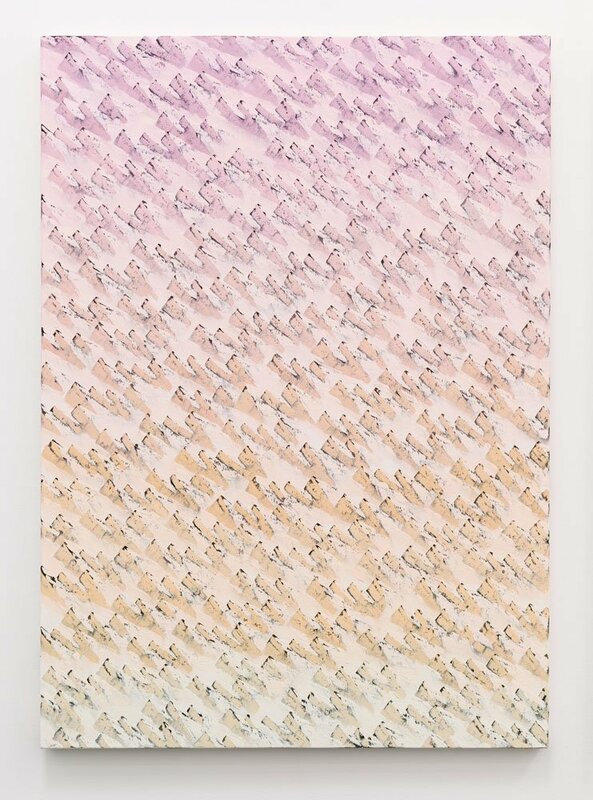 “Neil Raitt Exhibition at MonCheri, Brussels,” Purple Magazine, June 28, 2016. 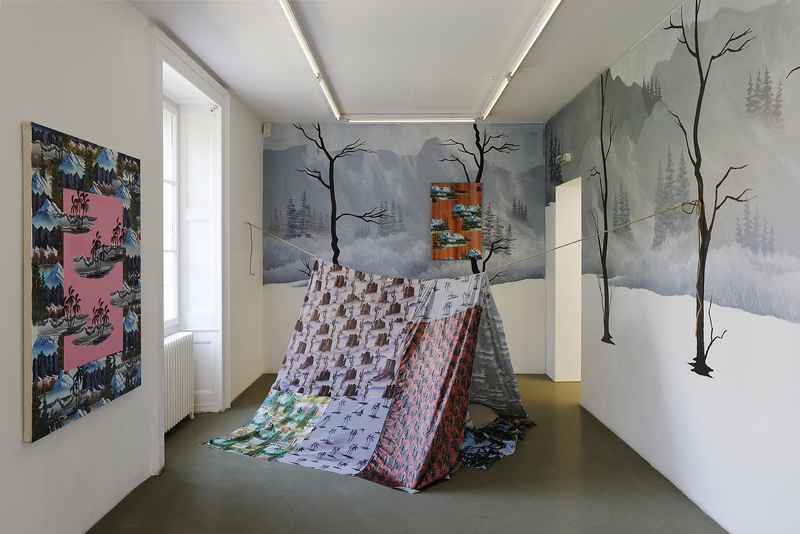 Federica Tattoli, “Interview with Neil Raitt,” Fruit of the Forest, April 2016. 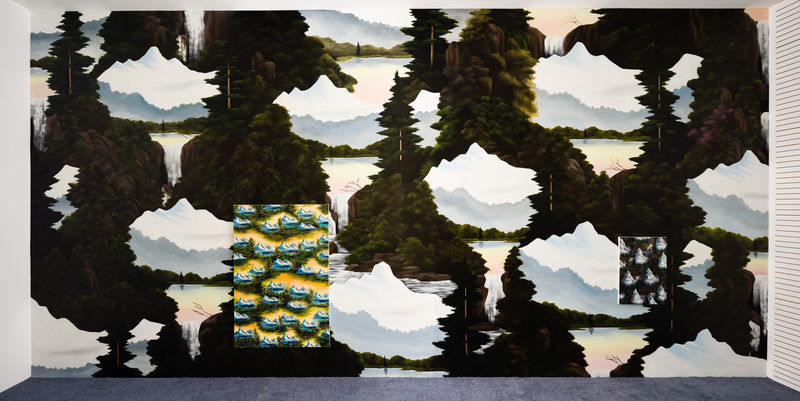 Federica Tattoli, “Anat Ebgi at miart 2016,” Fruit of the Forest, April 2016. 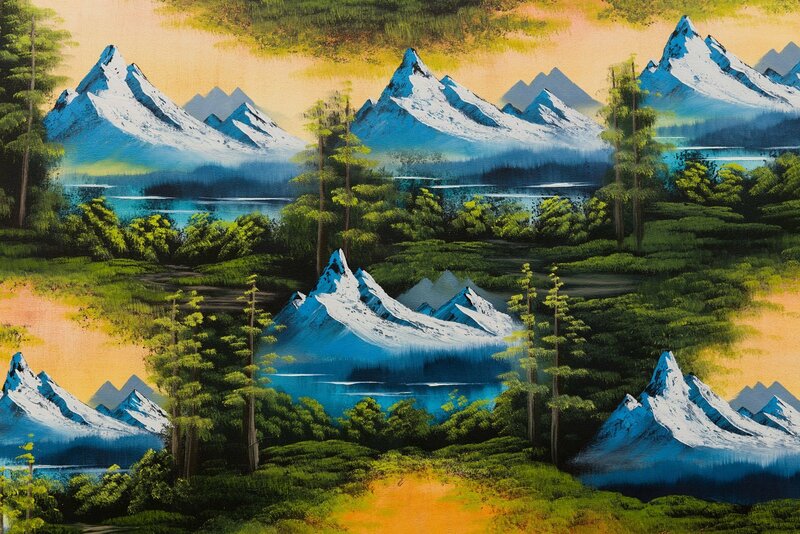 “Q&A with Neil Raitt,” MTV Redefine Blog, November 2014. 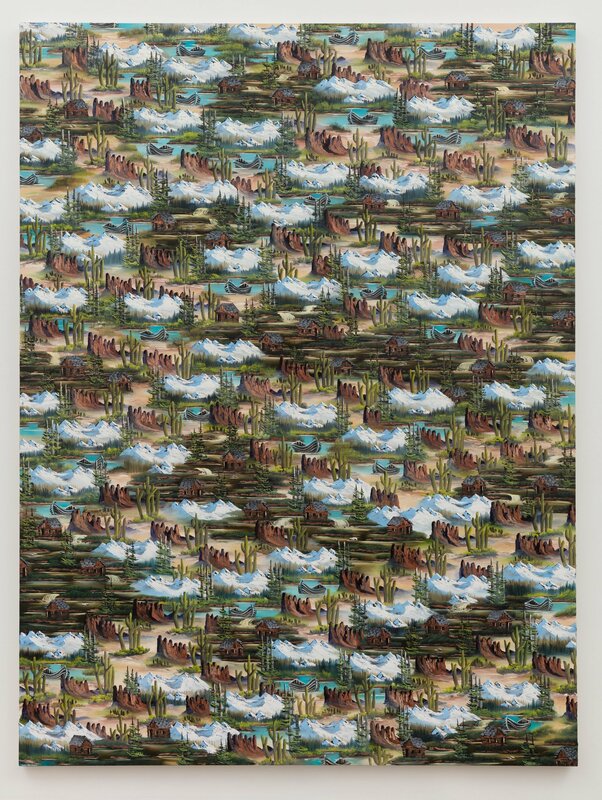 “Neil Raitt: CABINECTOMY,” Glasstire, October 22, 2014. 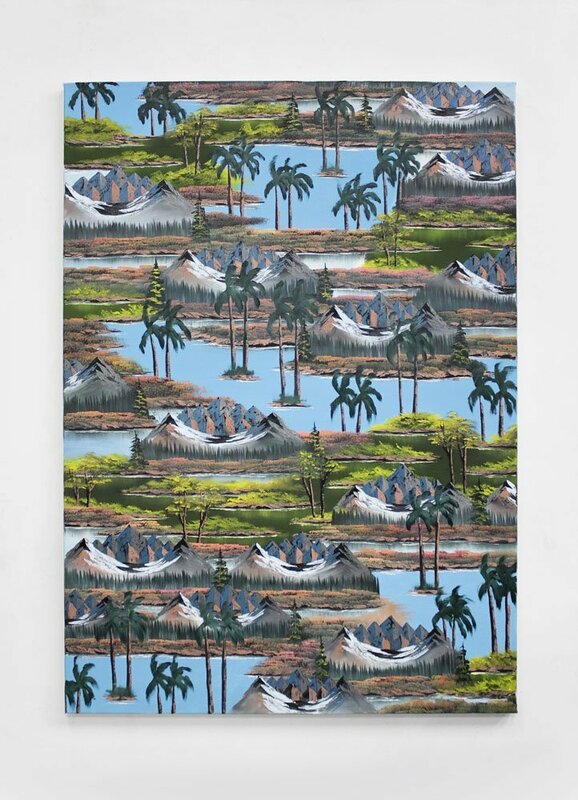 “Five young artists to look out for,” Artfund, May 14, 2014. 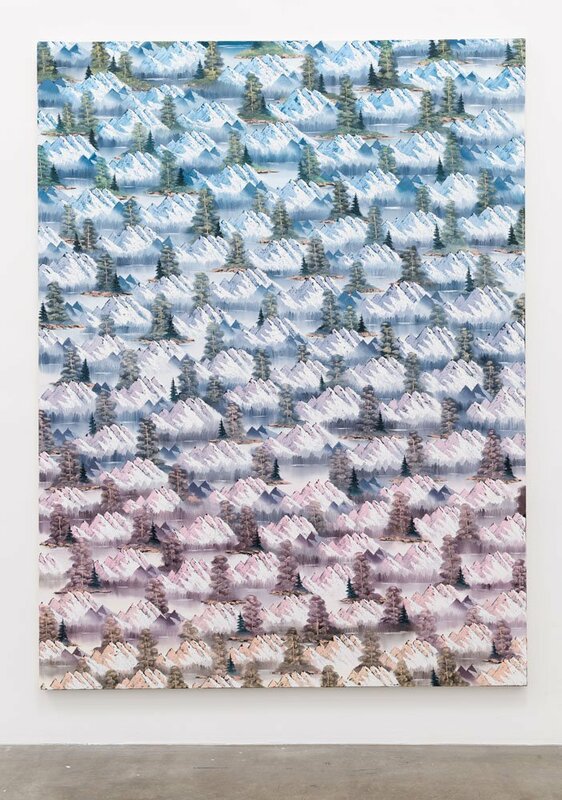 Harriet Thorpe, “INTERVIEW: Neil Raitt by Harriet Thorpe Caitlin Art Prize #7,” FAD Magazine, May 1, 2014. 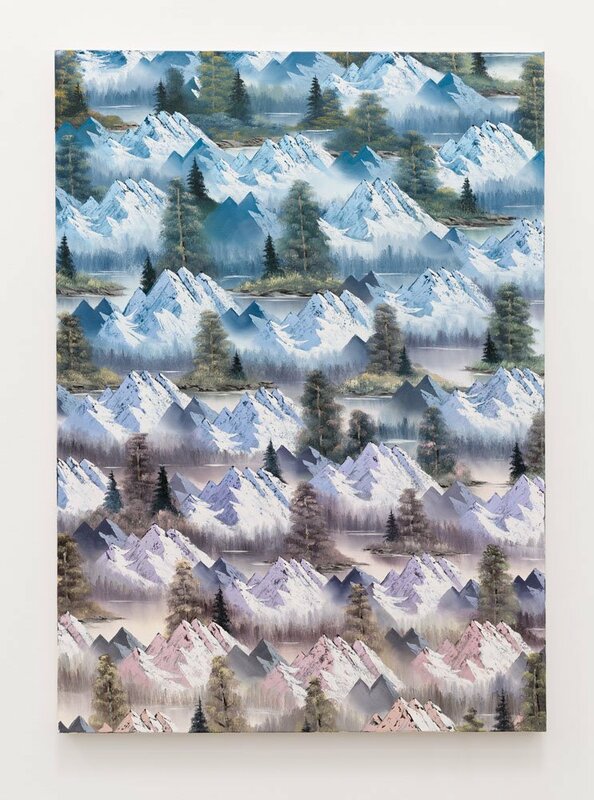 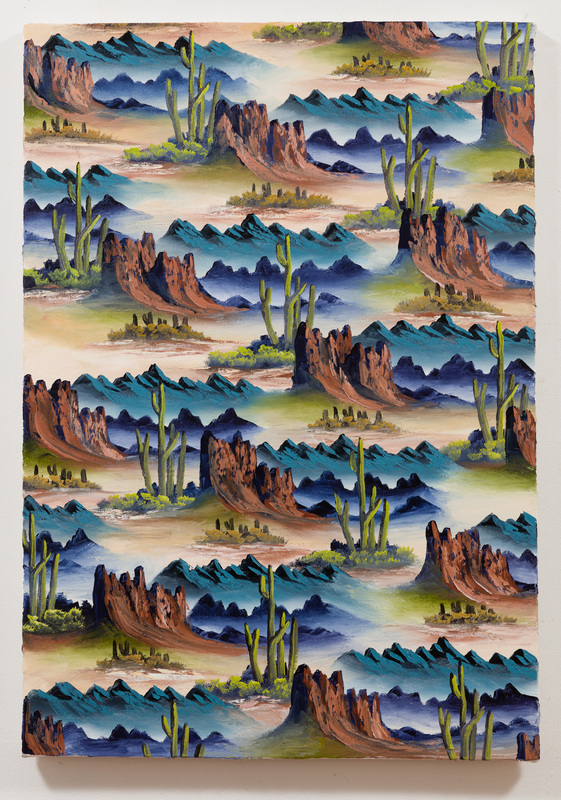 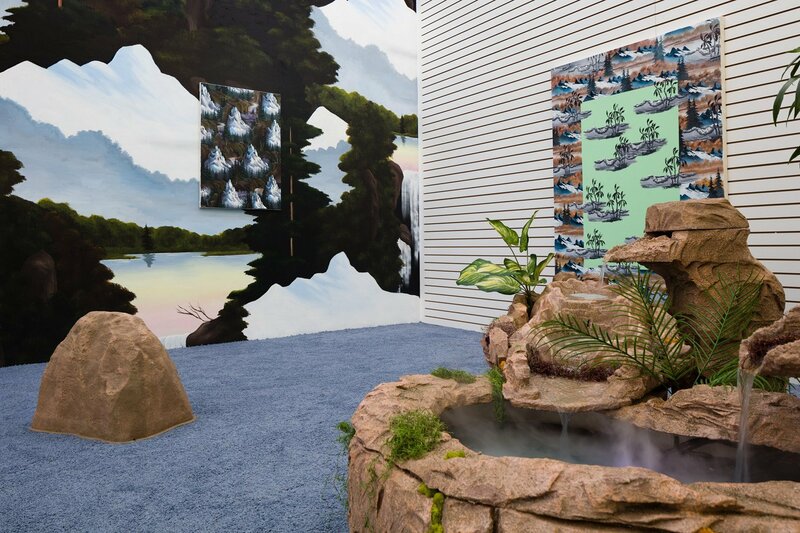 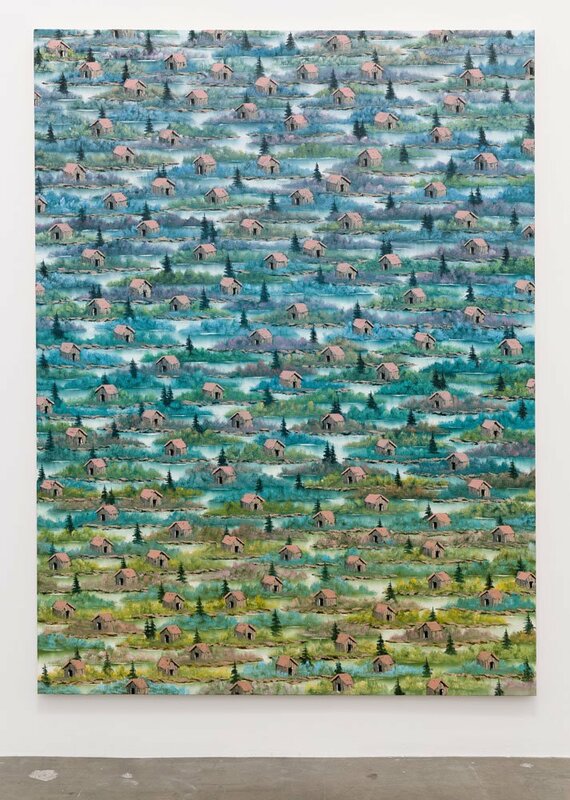 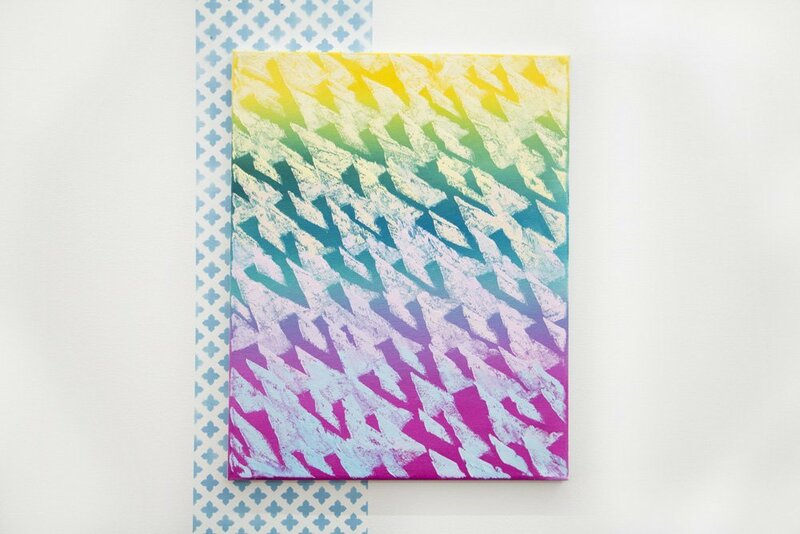 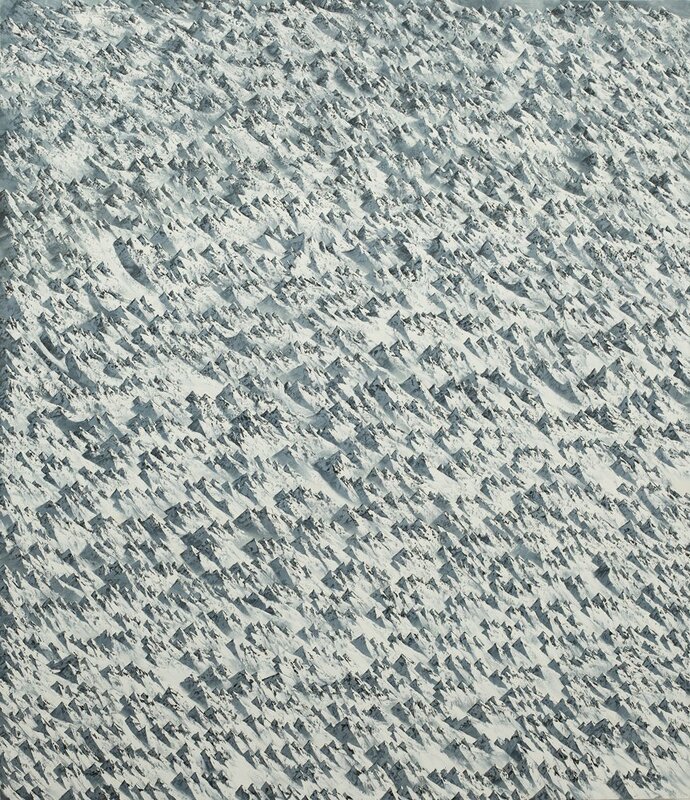 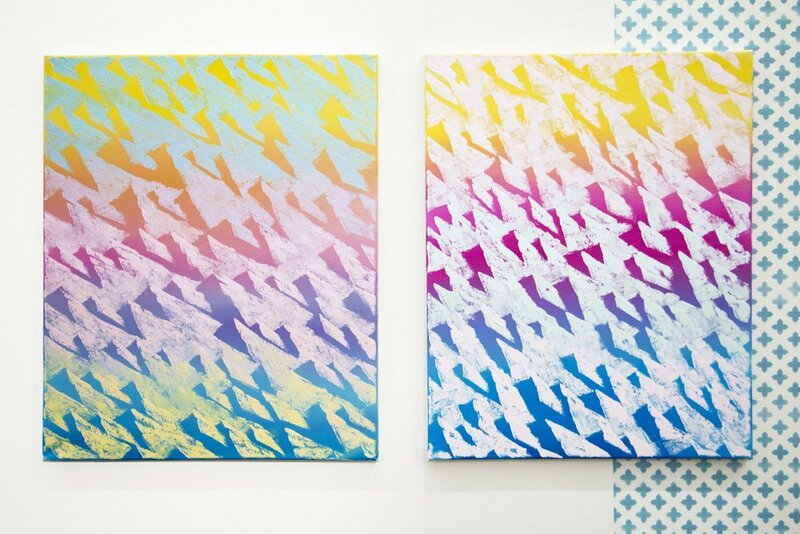 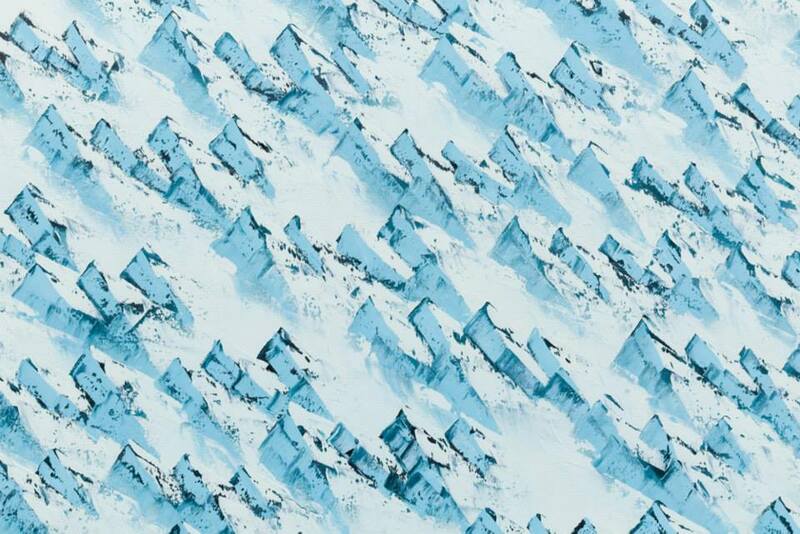 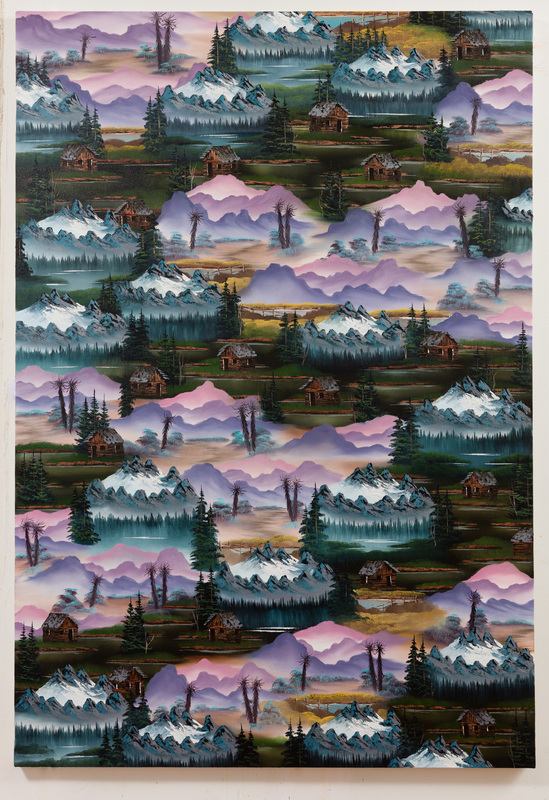 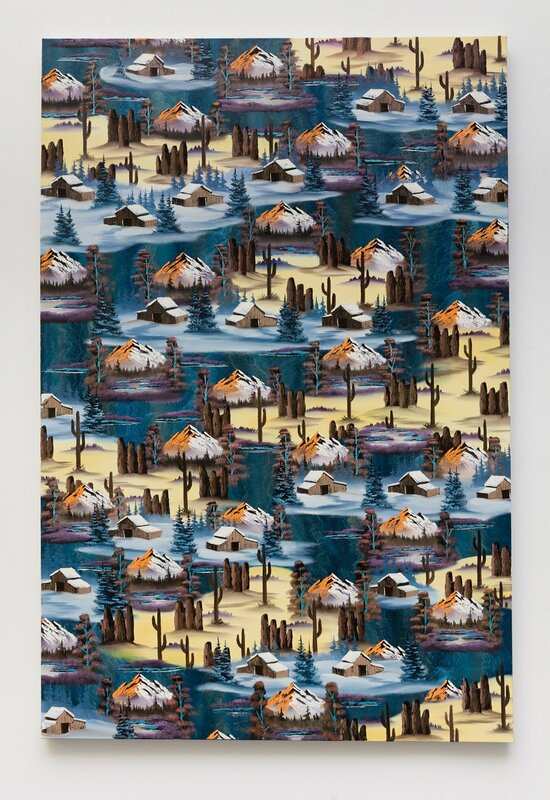 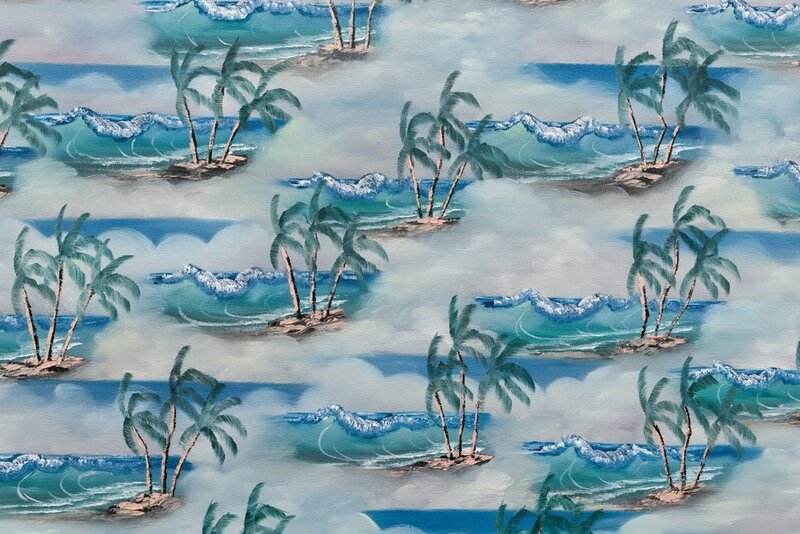 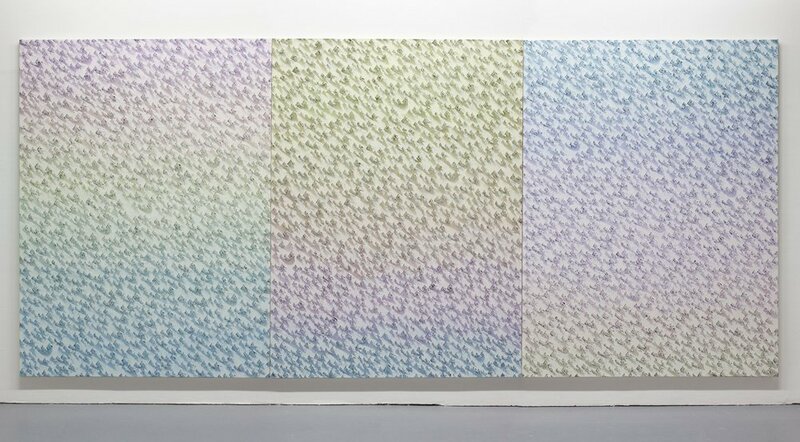 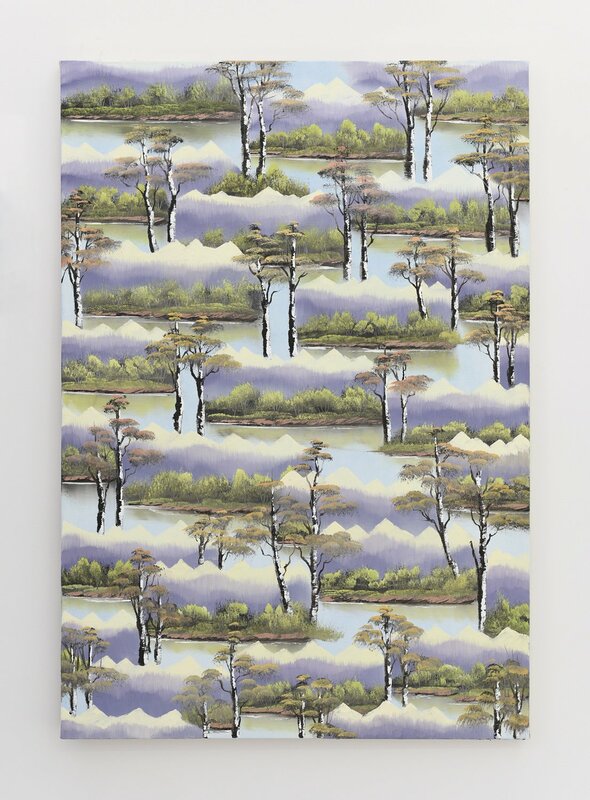 Emily Beber, “Art: Neil Raitt’s hypnotic landscapes will mess with your mind,” It’s Nice That, August 28, 2013. 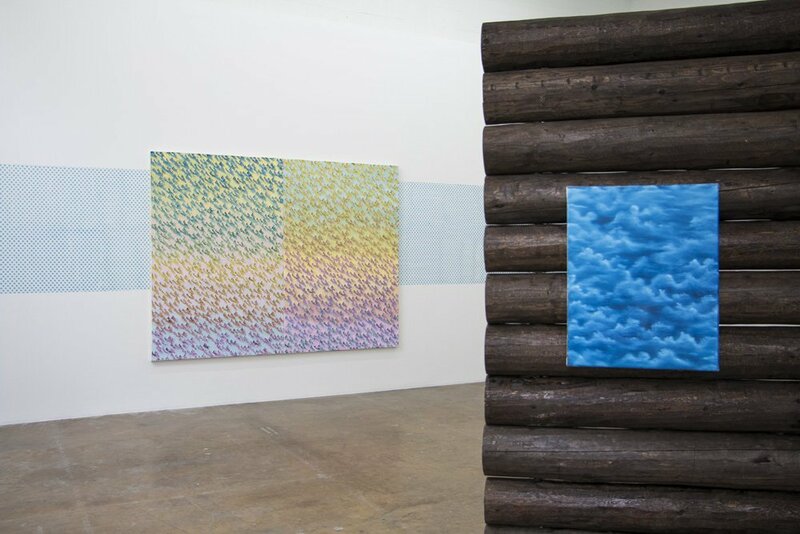 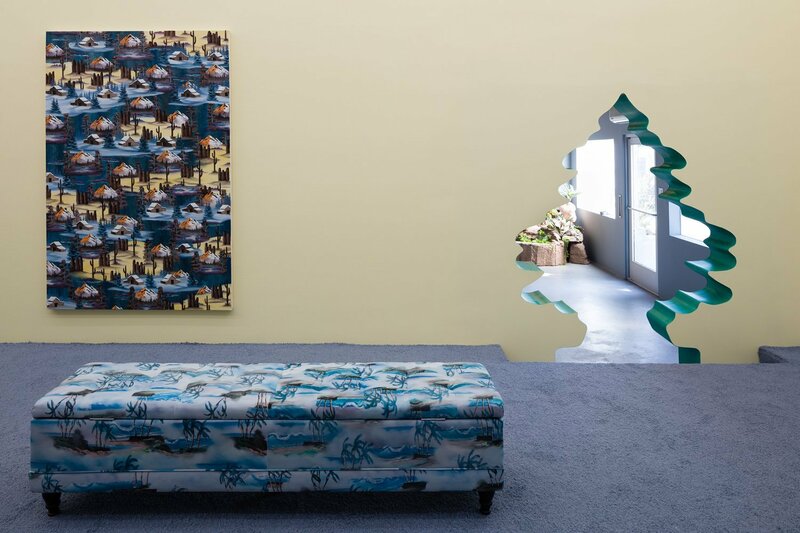 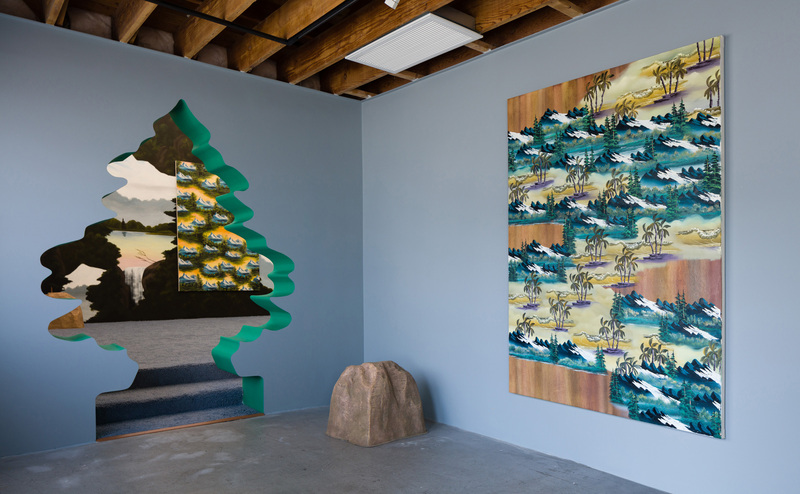 Neil Raitt, Cabinectomy (installation view), 2014. 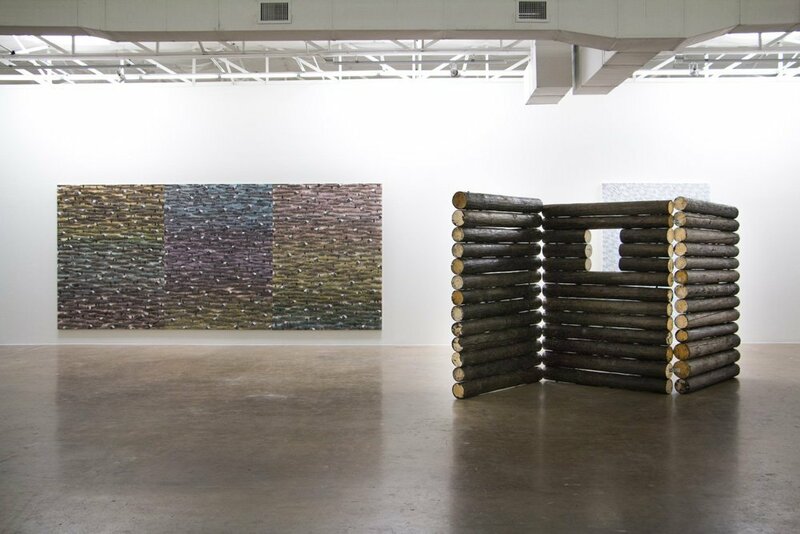 Goss-Michael Foundation, TX.